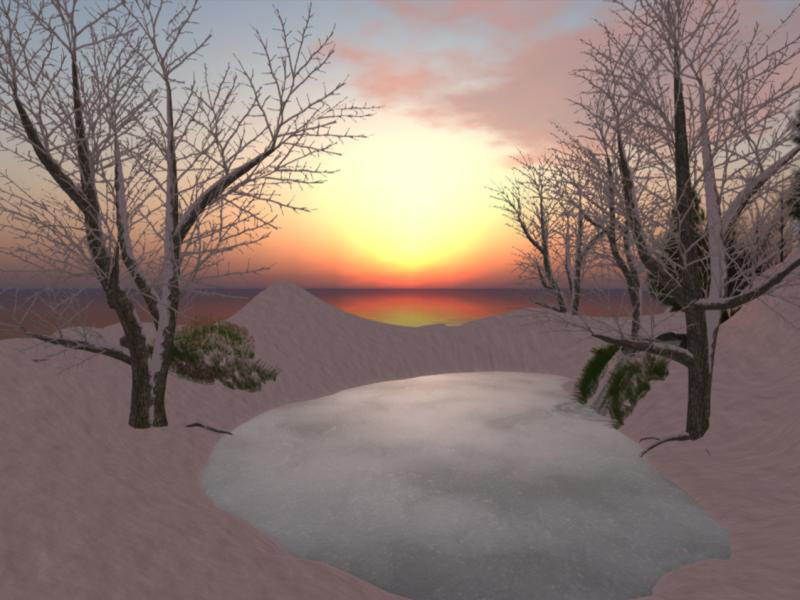 I logged in to Second Life this morning, wondering what I should use today as my jigsaw picture, and to check on a couple of new born kittens, and then I noticed a beautiful sunset across the snow behind my home. I caught a quick picture, but decided I could frame it better. So I moved my camera and finally has the trees, the pond and the sea behind positioned perfectly. By then, of course, the sun was gone, and in real life I would have been left to choose between the quick snap and a perfectly positioned picture taken in gathering gloom. But not, of course, in Second Life. It was easy to call up environmental settings – and I could have chosen half a dozen sunsets there – some rather too exotic. But I wanted the simple windlight I’d logged in with so I simply moved the sun position until it was exactly where I wanted, then played a little with atmospheric shaders and took my picture. I am not a great photographer by any means, unlike many we are lucky to have on the staff of Prim Perfect, but I do rather like being able to dial back the sun at my pleasure. Next Post: When will we get to grips with griefing?